This book looks at the experiences and achievement levels of Irish-born football migrants to Britain and further afield. In particular, it draws on interviews with twenty-four Irish-born footballers, each of whom has played league football in England or Scotland in the 1945-2010 period. This is the first book to utilise these migrants as a quantitative source, and to illustrate their experiences within the context of the Irish diaspora. It builds on a comprehensive range of databases to examine players� career movements and is illustrated throughout with tables and pictures. � It uses interviews with twenty-four Irish born footballers, each of whom have played league football in England or Scotland, utilising players from the Republic of Ireland and Northern Ireland on a decade by decade basis in the period from 1945 until 2010 as well as an extensive range of archival and other sources. � It is the first book to locate the study of Irish football migrants within the study of the Irish diaspora. An examination of the birthplaces of players is offered along with the reasons for their geographical diversity. As well as providing an assessment of the development of schoolboy coaching structures in Ireland and the social challenges which many young players have faced, particularly in rural areas, it discusses key childhood influences and the development of scouting networks. It assesses the recruitment process and identifies the Irish clubs which have produced the most players who have migrated and played first team league football in Britain, and in turn, it establishes the clubs in Britain which have given first team league football to the most Irish-born players. The impact of the Troubles on the migration of Northern Ireland born players is also discussed. An assessment of players� working conditions and the culture of professional football in Britain is given, particularly in light of the cultural adaption required, while the book also examines the changing nature of the post-playing careers of these footballers. The decline of Irish-born players within top flight English league football is discussed along with a number of difficulties facing future Irish football migrants. 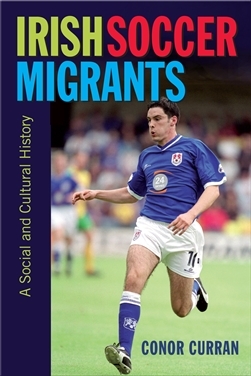 In locating the study of Irish football migrants within the study of Irish migration to Britain, Europe and the United States of America, and in comparing the experiences of Irish born footballers with those from other nations, this book is the first of its kind. Dr Conor Curran is an Irish Research Council Government of Ireland Post-Doctoral Research Fellow in the School of Education at Trinity College, Dublin where he is researching the history of Physical Education in Ireland. Previously, he worked as a part-time lecturer in Irish history at Dublin City University�s Open Education Unit and has taught sports history at the International Centre for Sports History and Culture at De Montfort University, Leicester. A former football trainee, his Ph.D. thesis was published as The Development of Sport in Donegal, 1880-1935 Cork University Press (2015). Four players interviewed had experience of both English and Scottish league football. These were Gerry Burrell, John McClelland, Barry Prenderville and Shane Supple.